A year dramatically impacted by the economic recession has influenced consumers to return to watching television over other types of entertainment. 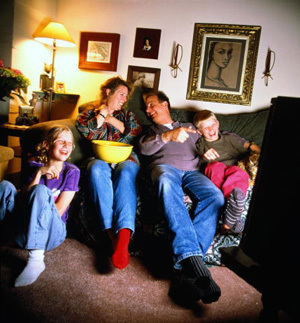 Deloitte’s 2009 “State of the Media Democracy” survey reveals a 26% increase in the number of Americans choosing the TV as their favorite type of media as compared to the previous year. More than 70% of survey respondents rank TV their top three favorite media activities. Additionally, when ranked alongside other activities like surfing the Web, listening to music or reading, 34% of consumers still place TV at the top. This is a substantial increase from last year and more than double the percent of the number two choice, which is the Internet that came in at 14%. When watching their favorite TV programming, 86% of survey respondents prefer watching on their television set, enjoying the programming either live, via a DVR/TiVo or using an “On Demand” feature. While less than 10% of Americans say they prefer watching the same content online, it is a growing trend. Nearly 18 hours of television programming is spent on TV in a typical seven day week – up notably from less than 16 hours last year. Millennials (ages 14-26) had the largest increase, to almost 15 hours from 10.5 hours. 72% of Americans say they have been forced to reduce their purchases of other entertainment products including movies, concerts, sporting events, DVDs, CDs and videogames. Besides TV viewing, the survey supports the culmination of the game console as a stand-alone media platform and the mobile phone’s rapid decoupling of the Internet from the desktop and the rise of tribal marketing. But, nevertheless, television continues to reign as the most influential advertising medium, with 83% of consumers identifying TV advertising as one of the top three media with the most impact on their buying decisions. Online advertising ranks much lower in impact than television. This entry was posted on Wednesday, December 16th, 2009 at 11:33 am and is filed under Trends, TV advertising. You can follow any responses to this entry through the RSS 2.0 feed. You can leave a response, or trackback from your own site.